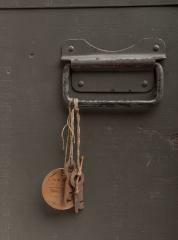 If you are responsible for a whole company of believers, strong faith alone might not be enough. 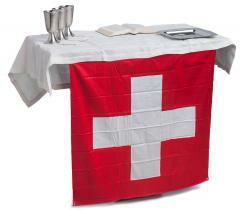 This Swiss-made portable altar is the cornerstone of a field hospital for the souls! 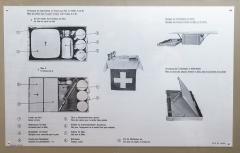 The purpose of a field altar is similar to a battalion radio, except this reaches the very highest level of command, and the operator is called a cleric. 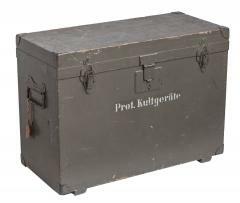 The technology is wireless and doesn't require a battery, but don't think you'll have it easier than signal corps: the box is larger than most radio sets we've come across from various armies, and weighs a whopping 30 kg! This means your body should be as strong as your faith in the holy Trinity. The altar serves the needs of protestant (Lutheran) sects, so any kind of scepters of funny hats aren't relevant. 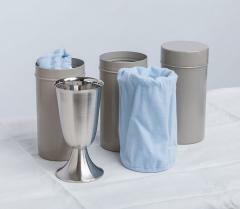 Still, the accessories included allow you to build a very decent Eucharist or other service in the woods or at home, when an actual chapel is not available. 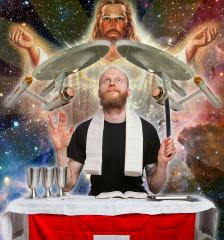 We're pretty sure Jesus himself would approve; if only he'd had one of these in his time. 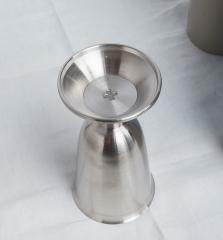 The wine flask is very practical: ethene plastic to withstand war conditions, and has a generous volume of 2 litres. 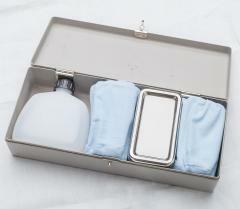 The bone-stock service is not complicated in this cult, but all kinds of small items are necessary anyways, and almost all items have a dedicated protective case or sleeve. All language is in German, which is the native tongue of God himself - ask Martin Luther if you don't believe us! 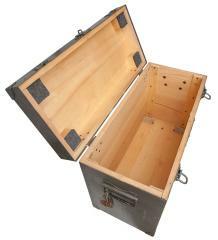 Inside a sturdy wooden box (with the text Prot. 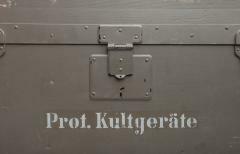 Kultgeräte, "Protestant Cult device") you'll find the actual altar case made of thick aluminium, and a plywood crate inside. 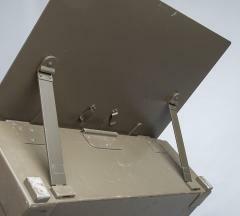 The small accessory boxes and such are sheet metal and other hardware made of steel. Once again we're looking at the only way the Swiss are able to do anything: really, really well. Used, but good condition. Various pieces manufactured in the 50's and 60's. This still has a lot of holy spirit left for decades to come!